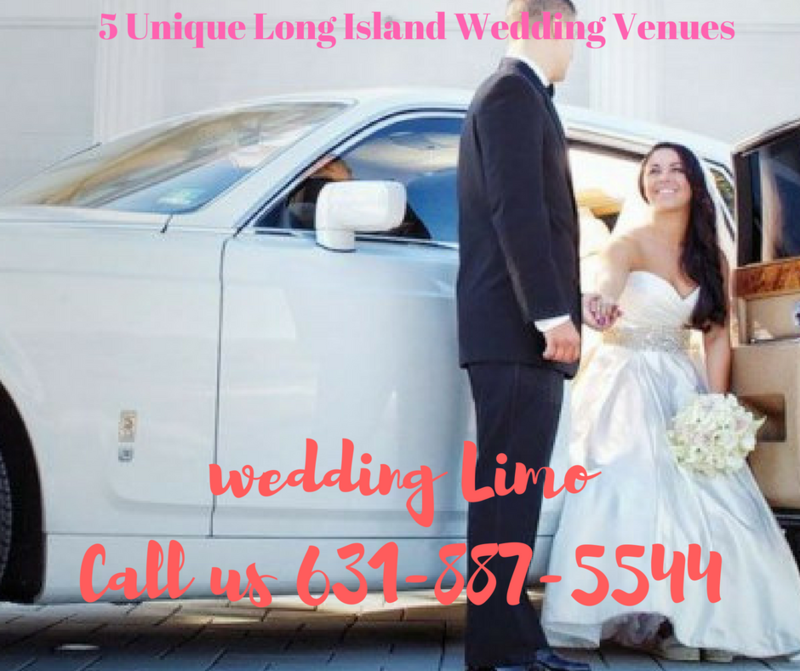 Long Island boasts of some unique wedding venues where you can say your vows and with an exceptional limo Wedding Packages Long Island, your transportation and that of your wedding guests will be taken care of seamlessly. From an oceanfront inn and castle to a classy vineyard and rustic barn, you can have your dream wedding in your chosen wedding venue. If you love drama, then The Suffolk Theatre situated in Riverhead is the perfect spot for your special day. With a magnificent art décor, multipurpose stage, theatrical lighting, and flexible seating arrangement that can seat about 600 party guests comfortable, you can be sure that you will love every part of your special day. And with our luxury car service Long Island; your transportation arrangement will be the talk of the town. If you love the sea, then you can incorporate your love for the sea as part of your wedding theme. The Long Island Aquarium & Exhibition Center offers an amazing view of the Peconic River, indoor waterfall and can seat up to 650 party guests at once. And when it comes to your transportation arrangement, our wedding transportation Long Island will be the perfect choice for you. We have a wide range of exotic limos that will be perfect for your special day. And if you want to make arrangement for your party guests, our shuttle bus rental Long Island will be a perfect choice. With luxurious seats and enough leg room, our party bus is definitely the right deal for your wedding guests. If you want to have a feel of the East End history at your wedding, the Brecknock Hall is the wedding venue of choice. The Hall was restored to offer life to this amazing gem of a venue constructed by David Floyd, the grandson of William Floyd. The venue is designed for an indoor event that can comfortably seat up to 85 guests. If you are planning a cozy wedding, this is the perfect venue for you. Wherever you are, our Camelot Limo Long Island will be the choice of transportation for your special day. Oheka Castle is considered one of the most magnificent wedding venues perfect for a princess. The castle features formal gardens, beautifully and stylishly decorated rooms, and immaculate services. You will love every moment of your experience at this unique wedding venue. With a seating capacity of 400, you can have one of the fairy tale weddings you have read so much about. Our wedding limo service Ronkonkoma NY will take care of all your transportation arrangement, so you don’t have anything to worry about. If you will love to make a statement about your wedding, the perfect wedding venue for you is the Bourne Mansion. Featuring a gorgeous view of the Fire Island and the Great South Bay, this wedding venue is a spectacular wedding location. It has a dinner capacity for 300 party guests and reception capacity for 400 party guests. This means you can have everyone you want at your wedding. Our cheap wedding limo service Long Island is your choice transportation arrangement for both your ride and that of your wedding guests. You don’t have to break the bank to have the best on your special day. We will be delighted to make your special day a unique event. Call us today for your exquisite Wedding Limo Service in Long Island and we assure you of a memorable wedding event.